Sometimes I look back and think about how ignorant and incompetent I was when we first hit the road – and I’m sure I will say the same thing when I read this article a year from now! After putting in countless hours of research, there are definitely some things that you just don’t think about until it all becomes a reality of daily living. The need for an autoformer is definitely one such item. A year ago, I would have thought an autoformer was some sort of new Decepticon villain from Transformers… and I’m a pretty smart guy (most of the time)! … a special type of transformer that employs a single non-isolated winding to step up or step down the available line voltage to match the requirements of the load. In “normal dude terms”, this means it’s a device that will adjust the voltage of an electrical connection. 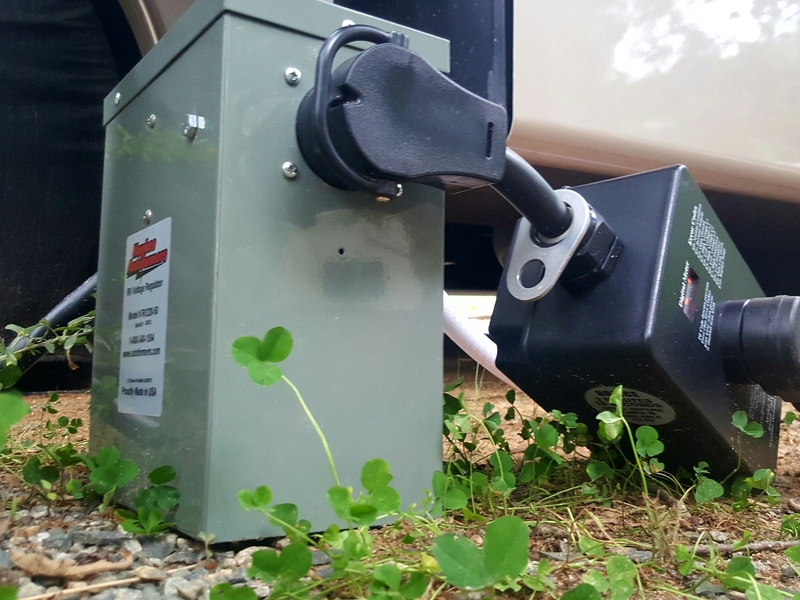 In the RV’ing world, we deal with two primary voltage systems: 12V (typically dealing with batteries) and 120V (normally from an inverter or shore power). This article concentrates specifically on the 120v shore power connection from a power pedestal. High voltage is typically not an issue, but low voltage can be a serious problem especially in older parks not designed for the modern, power-hungry rigs that are now prevalent. You see, the more amps that are drawn through an electrical grid, the lower the voltage drops (think of all the A/C’s sucking down power midday during the summer in a busy park). Chances are, the majority of RV’ers have been a victim of low voltage and never realized it. Many electrical management systems will have a low voltage cutout, but typically it’s very low – like in the low 100’s or even 90’s. When you dip anywhere near 100 volts for a sustained period, there is the major potential for damage to electrical components. This damage may not show up immediately, but it will definitely shorten the lifespan of the items on the receiving end. When voltage is low, the item makes up for it by drawing additional amperage. When more amps are pulled, more heat is generated. Heat destroys electronics. Ok, back to the autoformer and its role: when an autoformer is used, it will detect lower-than-optimal voltage and then “boost” it back into an acceptable range. How it does this is something that I’m not qualified to explain, but I can tell you that it does this job well. The Hughes Autoformer will boost by 10% anytime that voltage drops below 115V, down to 95V. Below 95V , it doesn’t have enough voltage to sufficiently boost and hopefully your EMS will pull the plug to the entire coach. The Hughes 50 amp Autoformer that we are using is such a simple device that it literally doesn’t even have an On/Off switch. If it’s plugged in, it’s on. If it’s not, it’s off. It does have three small lights; an amber light to tell you if the power source is “OK” to use and then two red lights to signal whether it is actively boosting either leg (50 amp lines actually have two 50 amp legs – so in reality, they’re 100 amp lines). It’s very similar to many other expensive items we buy; we hope it’s never needed, but glad it’s there when it is. In addition to it’s main function of boosting voltage, the Hughes unit offers surge protection of up to 733 joules per line. As with any surge protection device, it is a sacrificial lamb and will take the damage to keep it away from whatever it’s protecting (your entire RV) and may need replaced or repaired in the event of a power surge. Hughes was also nice enough to include their digital voltage meter to measure the current voltage from any 120V household outlet. I keep ours plugged in directly above “my couch” so I can keep an eye on it. In the name of very expensive redundancy, I have multiple hurdles in-between the pedestal and any 120V device connected to Lucky. First in line is the Hughes 50 amp Autoformer. Second is a Progressive PT50C EMS. Lastly is Lucky’s built-in electric management system. Before you ask, there is a reason for all of this and the order they’re placed – many people ask why not the Progressive EMS first. If I place the Progressive unit first, it could potentially cut power to everything down the line if voltage drops below its set 104V cutoff without ever allowing the Hughes to do it’s job down to 95V. Even though the Hughes has spike and surge protection, it’s not as robust as the Progressive EMS. The Progressive also serves many other functions besides surge and high/low voltage protection, so I feel much better that it’s looking out for all the electric demons bound to take us down. The EMS that Fleetwood included in Lucky is fine, I’m sure, but I really don’t know much about it. I do know it will “shed” loads when I’m nearing amp limits (on 20 or 30 amp hookups) by prioritizing systems to keep the coach under the amperage limits. I really enjoy knowing that if there was a catastrophic surge or spike, it would never even touch the coach’s power cord, let alone any internal components. If the internal system was responsible for keeping us safe and it took a hit, it would be a big problem to have no electricity until it was fixed or replaced. With this current setup, I could remove the damaged component and restore power (and pray for no more spikes until that piece is replaced in the lineup). Hughes does also make a 30 amp version of their autoformer. The changes are pretty obvious; it’s smaller/lighter, has a 30 amp cord, and only one red light to indicate boosting (since 30 amp only has one leg). With my 50 amp unit, I can use a “dog bone” connection to connect the autoformer to a 30 amp pedestal, same as I did before owning it. I have found that when I try to step down to a 20 amp (normal household plug) with the autoformer, it will either trip the GFCI or throw a breaker on the shore power. Being as how I’m not an electrician, I don’t know why, but that’s what I’ve found. Luckily, we rarely have to rely on a 20 amp plug for the entire coach. So why doesn’t everyone have one of these?? My guess is because most people don’t even know they exist! There are some other cons as well. First would be cost. the 50 amp Hughes Autofomer will set you back a hefty 500 bones (sometimes you’ll find them for slightly less, Amazon is a good gauge of current price). That’s a lot of money for something you hope to never use, I know. Second would be the unit itself. Not only is it one more thing to add to the endless list of RV gadgets we tote around, but it’s dense! At just a foot tall, this little cuboid weighs in at an impressively stout 35 lbs! That’s all I’ve got for this little grey box! It’s worked just as described and I’ve yet to have a low-voltage cutoff since I purchased it. I’m happy to answer any questions you’ve got on its use, but I’m afraid this article is about the max of my technical, electrical knowledge, so I probably won’t be much help there. I just want to say I’m so glad I found your blog. My husband and I are in our late 30s/early 40s respectively, and are working towards becoming full-timers within the next year. Your information and inspiration are keeping me on the golden road towards soul-fulfillment! Thank you for the posts, and keep up the good work! You and the RVLove couple are so valuable to me in my quest for relatable experiences and knowledge. Thank you, and see you out there on the road soon! Thank you, Sarah!! That’s very kind of you to take the time to say. Please let us know if there is anything we can help with as you make your dream a reality!